Tag line: "The Greatest Story Hitchcock Ever Told"
Initially published in 1966, Hitchcock / Truffaut was one of the first movie-related books I ever owned (I picked it up when I was in high school), and to this day I still occasionally thumb through its pages. 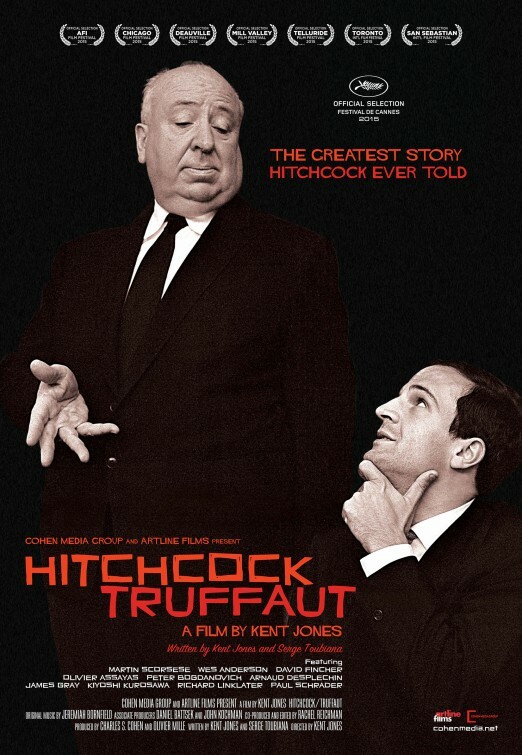 Featuring a series of interviews that Francois Truffaut conducted with Alfred Hitchcock (Truffaut’s friend Helen Scott acted as translator), the book is an exhaustive examination of Hitchcock’s career, from the silent era through to his later Hollywood films, and is today considered an invaluable resource for filmmakers and fans alike. Hitchcock / Truffaut, a 2016 documentary directed by Kent Jones, takes us behind-the-scenes of the writing of this great book, with audio clips of the actual interviews and still photographs of the two men seated at a table, picking apart what is arguably the single most impressive body of work in cinematic history. This alone would be enough to capture the heart of every die-hard movie buff. But by delving into its subject matter even further, inviting modern-day filmmakers to offer their take on Hitchcock’s career while also giving us a brief history of both the men who made this book a reality, Hitchcock / Truffaut also has something for the casual fan, and is the perfect starting point for younger cinephiles who may not be familiar with the Master of Suspense or his filmography. In addition, director Jones throws in a few tidbits about Truffaut’s early directorial efforts, with clips from such classics as The 400 Blows and Jules et Jim, reminding us that, along with penning such an essential book, Francois Truffaut was an extraordinary filmmaker in his own right. Among the directors who discuss Hitchcock, including how his movies influenced their own work, are such modern-day masters as David Fincher, Martin Scorsese, Wes Anderson, and Richard Linklater. But they do more than just praise Hitchcock; they take part in a lengthy analysis of some of the great director’s best-known films, like Vertigo and Psycho. By doing so, Hitchcock / Truffaut proves itself to be more than a companion piece to a classic book; it is also a world-class documentary that takes us beyond the margins, giving us more than we hoped for.